From the earliest days of Guiding, the highlight of the year has always been the annual unit camp, with many of the unit meetings in the run up to the camp being devoted to learning and practicing the practical skills, for in Guiding in the UK the tradition has always been for the unit to plan and run it's own summer camp, renting an empty grass field from a farmer and turning it into a comfortable home for a weekend or week (and in the old days, sometimes a fortnight or more) - the UK has no tradition of organised camps being run by paid professionals or paid staff as there is in some countries, and until the more recent decades, Guiding owned few permanent campsites. And we don't have wooden platforms for tents in the UK - we can and do pitch tents straight onto the grass. For girls in many areas in those early decades of Guiding, this would be their first ever holiday beyond perhaps visiting relatives, simply because of it's affordability - and for most it would be the first time they had ventured so far afield - significant numbers of Guides had their first ever sighing of farm animals, or of the sea, and their first escape from city grime, at Guide camp. And of course, the adventure of outdoor living was one of the most attractive and adventurous parts of the Scouting and Guiding, programmes, the very thing many of them had joined the movement for - learning the theory and techniques of knotting, signalling, stalking and the like back at the dusty church hall was all very well, but the chance to put that theory into practice for a week and do it 'for real' . . . that really was adventure! The first handbook of 1912 stated "We go into camp not only because we enjoy it so much but also to gain experience. A Girl Guide likes to try her hand at making things, and finding out how to do a thing herself in a way she can't do at home. Some people talk of 'roughing it' in camp, but these people are generally 'tenderfoots'. A wise Guide does not 'rough it', she knows how to look after herself and to make herself comfortable by a hundred little dodges". After all, the roots of Scouting can be strongly traced back to that first camp on Brownsea Island (and what an adventure sailing across the bay in order to take possession and camp on an island would have been! ), where Lt Gen Baden-Powell took a group of boys, in mixed Patrols, in order to try out his ideas on outdoor programmes for youths and see if they would work as well he hoped amongst different classes of boy . . . In the very early days, although the handbook promoted tents as well as indoor accommodation, most Guide Companies went in for what we would now term 'indoor holidays' - sleeping in a building, often a village hall or an empty barn at a farm - mainly due to pressure from society which considered that actually sleeping in a tent would endanger girls' 'delicate health'. For many units, camping itself was an experiment - there were few textbooks on how to camp, and few people had much experience of pitching tents, or how to arrange improvised cooking and bathroom facilities. Gradually, as camping became a more familiar activity generally, and was indulged in by all sorts of youth groups, cycle touring clubs and the like, to no ill effect, the public became more accepting of it, and more textbooks became available with advice on equipment and campsite layout. Thus 'real' camping in tents was the norm for Guides by the 1920s - nevertheless, every camper had to bring a medical certificate, signed by her doctor, to confirm that she was fit enough to camp. In the 1910s and early 1920s, the tents were all ex-army bell tents, the groundsheets were rubber or oiled canvas, the beds were old sacks made into 'paliasse' cases and filled with straw bought from the local farmer, the bedding was two heavy blankets folded and pinned into a sleeping bag shape using 'blanket pins' and the luggage would ideally be a duffle bag - as the army had been the only ones to camp before then, all kit was naturally improvised or 'army surplus', and suitcases (the only alternative to round kit bags in those days) were as impractical in tents then as they are now. However camping kit was just starting to become available to serve the growth in camping, both within Guiding and Scouting, and in the public at large, as can be seen from the numerous adverts in "The Scout", "The Guide" and "Headquarters Gazette" for all sorts of 'essentials' and some more interesting innovations (I'd love to see a photo of the 1920s/30s pneumatic tent, and find out how it was inflated, and what precautions were taken against puncture, or gales!). Either uniform or Guide blue 'camp overalls' would be worn every day, though skirts got shorter, and the black wool stockings might be dispensed with onsite, although insisted upon whenever off-site regardless of weather - just as would be the norm at home. With few Guides having access to proper waterproofs, drying wet clothes was an ongoing issue during a wet camp, and too many rainy days could be trying, especially as the kit list was very limited (many of the poorer girls wouldn't own many changes of clothes anyway) - no need for the thermals modern Guides seek when you are used to living in a house with no double glazing, cavity insulation or central heating. Some army traditions were still maintained - some early camps still had Patrols take shifts at collecting rations and blankets and heading off to 'guard the camp' overnight, and (still done at many camps nowadays) the flag was hoisted in the morning and lowered at dusk with full ceremony. Inspection often involved each person's kit being laid out formally on their groundsheet in front of the tent, perfectly polished and folded, to be checked for neatness. In the absence of bugles, whistle and hand signals were used to issue instructions to the Company, with a set system of signals devised for use in camp, utilising both whistle and hand signals - some units used these at their indoor meetings too, especially in the case of larger units - for instance, the raised hand for silence. Many of these things are still done at camp, if in a less formal way, and are still practical - a whistle is still more audible and much more practical than trying to shout across the length of the field, and beds still need to be aired and bags packed in order to allow the grass to air and the lost property to be found . . .
Camp was always at least a week, some lucky units were able to camp for longer periods - although in working class areas those 14 and over might not be able to stay longer than a week due to limited annual leave from work. Camp allowed time for exploring, picnics, and lots of nature lore, as well as giving the girls the chance to learn the practical skills of cooking and self-reliance. It was also a chance to test those parts of Second and First Class ideally suited to outdoor work - the observation, tracking, signaling, nature study and First Class hike, along with putting into practical use those Tenderfoot knots which had been so carefully learnt. In those days most camps would hire their camp equipment from one of the many companies which sprang up to supply the need, or would make their own tents following the instructions printed in "The Guide" magazine - only the wealthy few could actually buy new tents without a lot of hard saving and fundraising first (some things don't change!). Both the luggage and the Guides would travel to camp by train, charabanc, or on the back of an open lorry or in a furniture van (or for nearby campsites, it would be hauled by the Guides themselves on a Guide-powered 'trek cart'). Food was bought from the farm (milk, eggs, sometimes fruit and vegetables in season, water often being drawn from the farm's well or pump in the yard) which helped maintain goodwill with the farmer - and groceries, meat and bread were invariably ordered from village shops, and either collected by the Orderly Patrol or delivered to the site by the shop's delivery staff - as well as the convenience of flexibility over quantities which came from ordering supplies daily, it ensured the campers were welcome visitors to the community, bringing income to what were often financially deprived rural areas - and it also reduced the difficulties of fresh food storage. Camps were generally run by the unit's own Captain, perhaps (but not necessarily) with the help of a Lieutenant, or a Camp Nurse (usually a qualified nurse or VAD) - seemingly regardless of the size of the unit - there are plenty of reports of large camps of 30 or 40 Guides with only one adult in those early, comparatively rule-free days! The full camp kit list suggested in the July 1912 handbook was "1 old coat or waterproof, one wool combination, one pair stockings, one woolen vest, flannel nightdress or sleeping suit, one pair stout walking boots or shoes, one bathing dress, hairbrush and comb, soap and towel, toothbrush, four handkerchiefs, paper" - plus wearing one's full uniform, of course. So they clearly believed in packing light if that was considered adequate kit for a week! And though the kit list makes no mention of dishes, these would inevitably be metal, or possibly enameled . . . for bakelite and plasticwares did not yet exist. The hallmark of any early camp would be 'pits for everything'! The latrine was a long narrow trench (just over a spade-width), fenced by stakes which had a layer of hessian wrapped strategically round them, for modesty and to create cubicle dividers and doors which fastened with pieces of cotton tape. In each cubicle would be a wooden 'sugar box' to sit on, the lid being removed and the box turned upside down and balanced over the trench, with a round hole cut out strategically in what had been the base of the box - this formed a combined 'seat and base unit' perch. The soil that had been dug out from the trench was laid in a heap within the hessian boundary, with a trowel to hand, so that after using the latrine one could 'cover one's tracks' with some of the loose soil before leaving the cubicle fit for the next person - each morning the boxes would be moved sideways within the cubicle to left or right in turn, thus moving them gradually back and forth through the week so that the trench was refilled evenly along it's length by the end of the week. (Though this sounds primitive to modern eyes, it has to be remembered that such an arrangement wouldn't be so far different from the 'outside toilets' many of the girls would have had at home, which in some cases would be 'dry-earth closets' anyway). Some food waste could go in the 'pig pail' for the farmer to feed to his livestock, and scrap paper and card could be saved up for firelighting - but other rubbish such as tin cans underwent 'bash and burn' - the insides burnt to leave no trace of food which might attract vermin, then the ends removed and the tin stamped or malleted flat, and put in the 'rubbish pit' for burial. Waste water was filtered through a layer of grass or leaves in the 'grease trap', which was set above a 'soakage pit' of stones, which is also where the water from washing up would go, with the filter regularly being burnt and replaced - just as many sites still do now. The most common form of fireplace then was the trench fire - standing in the trench allowed the cooks to be spared so much bending over the fire when tending to pots, but it took a lot of digging to create the trenches large enough for the cooks to use - the altar fire was a postwar development in most areas. Usually, campers were encouraged to 'pay a man' to dig all these trenches and pits - in days when rural employment didn't pay well, it wouldn't be hard to find someone willing to do the work for a modest fee. Lightweight camping had certainly yet to come to the fore . . . and with all these preparations to be done for even a modest unit camp, it's not surprising that weekend camping was almost unheard of in these early days! During the 1920s, camping expanded dramatically, just as Guiding expanded dramatically. Comparatively cheap rail fares meant that many Companies in urban areas could now afford to travel to sites in the country, though there were still regular appeals for financial assistance published in the "Headquarters Gazette" from those units whose members could not afford even a modest camp fee due to the economic situation in the era, particularly in working class industrial areas where unemployment was high due to the depression, and the General Strike loomed. At the same time, camping within Guiding became more organised - the District Commissioner's permission was now needed for a unit to go camping, and a system of County Camp Advisers was created, who were able both to organise "training weeks" for Guiders who wished to take their Companies away to camp, and also to assess potential campsites for their suitability (or lack thereof) - there was a list of areas of the country where camping was totally banned. A qualification for camping was created, with all Guiders who wished to take their unit away now having to be assessed, and most camps faced the prospect of a formal inspection visit by the local Camp Adviser at some point during the week, her uniform hat and suit bedecked with green cords! Nevertheless it did improve the general standard of camping, as some very unsuitable camps were closed down . . .Water for swimming (or 'bathing' as it was more commonly termed at the time) now had to be assessed too, and a qualified lifesaver and several 'pickets' used to ensure safety. Another reason for the expansion of camping was that more equipment became available and affordable, especially army surplus in those post-WW1 days - stacking 'dixie' and 'billy' pots, bell tents, groundsheets and trek carts became commonplace as they were being sold off cheaply, and many units were now able to consider obtaining their own camping kit at this time, rather than always having to rely on hired kit with the uncertainty over quality and condition that entailed, especially in summer when the hire companies were at their busiest and could not always be relied on to have checked kit properly between hires, or to have resisted the temptation to make that barely-waterproof tent do one more season! It was also more socially acceptable for girls to camp, too, indeed camping was being taken up by many other youth groups, cycle clubs, hikers and hillwalkers, as an affordable way to see the country at a time before Youth Hostels became widespread. With this came the first real advances in creating lightweight camping kit, with the gradual adoption of such things as the ridge tent instead of the bell, the scandinavian frame rucksack rather than the awkward-to-carry round drawstring-tied kitbag which had to be balanced on one shoulder, the rubber wellington boot providing the first truly waterproof footwear where previously leather boots or shoes had had to serve, those who could afford them, and the increasing availability of waterproof 'mackintosh' coats and capes, and enamel crockery rather than metal, so much easier to use without burning the fingers and at much less risk of tainting the food. Camp attire, too, became much more relaxed as society's clothing rules relaxed, hemlines rose to mid-calf, and it became acceptable to have bare legs on the campsite (although wool stockings would automatically be put on before going into the village) - open-necked 'camp dresses' and ties worn as headscarves became the norm, often teamed with canvas or rope shoes. Cooking was still always done 'Company' style, with each Patrol taking turns at spending the day as 'cooks', preparing all the meals for that day, but small stoves such as the 'primus' became available, bringing the chance to heat small amounts of water or food quickly without the need to keep the fire going all day. 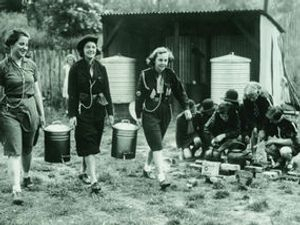 The 'World Camp' which was held alongside the World Conference at Foxlease in 1924 also helped to cement the place of camping in Guiding, both in the UK and around the world. The contingents from various countries picked up lots of ideas and techniques from each other, and as the first large-scale Guide camp in the UK, it set the path for all future large-scale and international Guide camps which have been held here since. The start of the 1930s was a sort of golden era for camping - new equipment was becoming more available (early canvas rucksacks with wicker or metal frames, compact battery-powered torches replacing the risky candles, the "Icelandic" tent from 1930 onwards at bargain price as hundreds of the 'only used for a week' tents became available at second-hand price, and waterproofs becoming more available), affordability of bicycles giving more transport options - more units than ever were getting the chance to go to camp, and official 'Guide campsites' were starting to be established - following on from those at Foxlease and at Waddow Hall, some Counties in different parts of the country were lucky enough to have suitable land donated, or to be in a position to buy some land of their own. Train companies were able to offer special rates for groups, and to send 'luggage in advance'. Trainings, too, were becoming well established, and the work of the Camp Advisers had served to raise standards and reduce the number of 'problem camps' around the country. And with the opening of "Our Chalet" in Switzerland, the prospect of international travel became open to some of the more wealthy units too. But throughout 1938, the shadows started to lengthen, and in 1939, just as the main camping season was drawing to a close, there was major change afoot. On 3rd September many campsites immediately closed, the campers had to strike camp and leave straight away, and camping stopped in all areas. Some units had their camp equipment requisitioned for war use by groups such as the Local Defence Volunteers (Home Guard), and most of the Camp Licence holders were of an age to be called up for war service immediately. After the initial quiet period, during the summer of 1940 in the South of England in particular, the threat of air raids was a constant worry. In spite of that, and subject to certain strict rules - the ban on camping was lifted and some camping was permitted. Camps had to be a certain distance from the coast or from any military installation, all of the tents had to be camouflaged using paint or (preferably) nets covered in foliage to break up the distinctive shape, there must be no visible lights at all after dusk, and large gatherings were definitely not permitted - and an extra slit trench large enough to hold all the campers had to be dug, to serve as a makeshift air-raid shelter. There was also a ruling that camps had to be held within a reasonable radius of home - but that wasn't exactly a barrier since petrol was heavily rationed, and people discouraged from unnecessary train travel, hence travelling far was impossible anyway. Still, the lack of licence holders to run camps was a big problem, so in 1941 a radical new scheme was introduced - the "Patrol Leader's Permit". This allowed a Patrol Leader to take her Patrol to camp even if there wasn't an adult available to go with them, and it opened up the possibility of camping to many Guides who had been missing out . . . and it still exists. Camp catering during wartime was also a major hurdle due to rationing - the camp had to register in advance with the Ministry of Food in order to get any supplies at all from a local grocer, there was the need to deal with each person's 'coupons', and the oddments of food that each brought with her if the camp started part-way through a 'ration week' - and working out what each person's share to take home afterwards should be too, so they would have enough food to realistically last until the start of the next ration week. Rationing applied to meat, butter, cheese, margarine, cooking fat, milk, sugar, jam/marmalade, eggs, tea and sweets. Other supplies might not be rationed, but could still be difficult to obtain, so vegetables and 'substitutes' featured heavily in wartime camp menus. Especially for those camps held later in the year, the 'blackout' ban on any lights after dusk meant that all cooking had to be finished and the fires covered or put out in good time, ruling out late night hot drinks, or real campfires after dusk. With the encouragement towards war work and 'dig for victory', many units went 'farmping' - holding their week's camp based on or near a farm in order to spend their days helping out the farmer with tasks such as weeding or harvesting crops, and gathering hedgerow fruits to be preserved. During the war (and in the immediate post-war years) another difficulty was lack of camp equipment - some camp equipment had been requisitioned at the outbreak of war and was slow in coming back if it was returned at all, other items had been damaged or destroyed in bombing, factories were focussed on production of war materials, and personal kit, if it was obtainable at all, cost too many clothing coupons - so if kit could not be borrowed then adaptation became the only way. Tin cans could have wire handles fitted to become nesting billies. 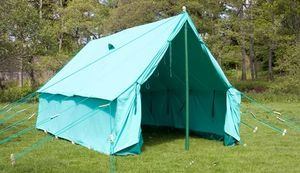 Tents could be made from old canvas fabric painted with home-made waterproofing solutions, wool oddments could be knitted into 'sleeping bags' to go inside the blankets, and damaged old waterproofs could be cut down and sewn into new garments or made into waterproof storage bags . . . wellingtons were totally unobtainable and waterproofs near enough so, but with a bit of determination, improvisation, and a lot of asking around and rummaging in attics and outhouses for forgotten pre-war oddments, a makeshift camp kit could be gathered, 1910-style . . . and the Guide shop stocked whatever items they could obtain as best they could given the circumstances . . .
From the mid-1950s, camping boomed again. Ridge tents such as the Icelandic, Niger and Stormhaven became more widely available, army surplus kit was widely available and affordable, and the newer convenience foods emerged, making life much easier for the Quartermaster. The wider availability of cars and vans made more remote campsites easier to get to - but the increase in traffic and some nasty accidents signalled the end of the trek cart, and saw hired private coaches becoming more common than open lorries. More and more Counties obtained their own campsites, many of them having equipment stored onsite, which reduced the difficulty of sending heavy canvas tents and awkward poles as luggage on trains, and brought things full circle back to the 'hiring' days! The old 'box over a hole' latrines were gradually replaced by chemical toilets such as the 'elsan' which were used with individual 'toilet tents' which allowed greater privacy - but still required a 'lat pit' for emptying, and had a chemical smell all of their own which anyone who used them will well remember! 'Altar' fireplaces began to become available, which saved on bending, or digging trench fires, and lightweight aluminium metal pots, and plastic pails and basins (rather than enamel) helped to cut down on the weight and bulk of the luggage - and the introduction of tinfoil opened up lots of new possibilities for 'backwoods' cooking. It was also during this time that 'Patrol Cooking' became used more widely, and rapidly took off. Guiders could see that the slight extra expense and workload at first - was fully justified by the way the Guides learned to cook for themselves, and do their own menu planning - and the teamwork skills it taught. Nylon sleeping bags became more affordable, allowing bedding to become warmer than the traditional 'two blankets and four pins' homemade sleeping bag - though the blankets were still retained, as an outer layer around the sleeping bag. Up to now, Ranger camping had been near-identical to Guide camping, but advances in kit meant that lightweight camping especially took off with the Ranger section - now portable 'Primus' and 'camping gaz' stoves became readily available, and lightweight 2-peson tents with aluminium poles instead of wood or bamboo too, which made it much more feasible to go on overnight or weekend hikes with everything necessary being carried on the back. Frame rucksacks became much more available and affordable, and plastic crockery was lighter than enamel. Nylon 'cagoules' came in, much lighter and more waterproof than the old 'mackintosh' or cape, and waterproof trousers were produced too. 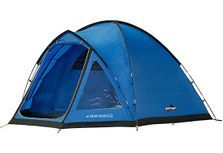 All this lightweight, waterproof kit also made it easier to combine camping with adventurous country activities such as climbing, hillwalking or pony treking, and cycling or canoeing tours were also popular. During the 1970s and 1980s, camping itself did not undergo radical change - but campsites did. Mainly, it was down to campers' rising expectations, which led to more of the established campsites opening up 'providores' or shops selling basic supplies and souvernirs, providing basic onsite adventurous activities such as orienteering, pioneering and backwoods cookery, and looking to build toilet blocks, and in some cases supply electricity for lighting. Some technologies gradually became available - such as the 'coolbox' and the gas boiler, but otherwise, technological advances were few and camping continued mainly unchanged. So, the big change that did happen in that era wasn't to the style of camping itself, but to the duration of camps. Weekend camping had always been a popular option for Patrols to get away by themselves during school termtime, but up until now, unit camps had always been a week or more away - now many Company camps were having to move to being of shorter duration, and even to being weekend camps, as more Guiders worked at full-time jobs and could not spare so many days from their limited annual leave allowance. The downside was that camp programmes became more crowded and hectic, as leaders still tried to fit in as many as possible of the usual camp activities into their programmes. Where before a programme might have read 'Saturday - arrive and pitch, make gadgets, Sunday - explore village and finish gadgets, Monday - nature walk and picnic, Tuesday - sports day, Wednesday - day out, Thursday - badgework and skills testing, Friday - wide game and initial clear-up, Saturday - strike camp' - now the programme read more like 'Friday - arrive, pitch camp, explore site, Saturday - gadgets, badgework, wide game, campfire, Sunday - sports, strike camp'. In the rush to literally try to squeeze most of a week's worth of activities into 48 hours, time to 'stand and stare' at the surroundings, chat over the dinner table, or take a quiet walk and appreciate the locality or observe nature was lost in the rush to always be 'doing something', and not 'waste' a minute . . . Guides could end up going home more exhausted after their 'holiday' than when they had arrived! The 1990s and 2000s brought more tent innovations, lightweight 'family' nylon tents with 'inners' and fibreglass poles meant that new shapes and styles of larger Patrol-size tents became available, with 'pods' and 'tunnels', meaning that lightweight camping no longer had to be the preserve of Rangers. Although in theory more lightweight, their larger size and additional features meant that the weight actually wasn't that much lighter at all! Nevertheless, the separate bedroom areas allowed the Guides (and particularly the older Guides) more privacy, and allowed central space in the tent for luggage to be stored, separate from the bedrooms. The downside to the built-in groundsheets was that they killed the grass below the tent if left down too long, so many sites instituted rules that the tents had to be moved every 48 hours - thus many sites and units stuck to their Icelandics. Cooking innovations such as gas cookers became more common too, as questions began to be asked about whether wood fires were necessarily the best option for the environment. On the other hand, as recycling became fashionable, we realised that our pre-existing habits of separating out rubbish to cut down the amount in the bin bags, and the habit of recycling food waste and re-using paper waste for firelighting - put camping ahead of the norm in the newly-fashionable 'green' stakes. Marquees were less frequently used, as many sites installed storage huts which were large enough to double as wet weather shelters - or even purpose-built huts or buildings with mod cons. Toilet blocks became the norm, some even incorporating showers, electric light and hot running water. Kit advances, too, made a big difference, with the rectangular nylon sleeping bag being replaced by the 'mummy' style bag, designed to cope with use in cooler weather, and heavy canvas metal-framed rucksacks being replaced by lightweight nylon rucksacks with greater capacity for less weight. Foam rollmats and 'thermarests' offered alternatives to either lying on the hard ground, or trying to avoid rolling off metal-framed campbeds or heavy rubber airbeds. Coolbags and boxes became almost standard in place of the improvised hanging larder and bucket-in-the-river dodges, and gas water boilers became more readily available, making it easier to keep a constant supply of hot water on tap. Camping had also become much further removed from the Guides' home life than ever before - whereas in the past the cooking fire wasn't that far different from the 'range' and coal fire at home, and the trench lat not so different from the outside toilet in the back yard, now Guides found camp very different from their centrally-heated double-glazed homes with electricity and hot water 'on tap'. In the 2010s, the unit camp is becoming rarer, as Camp Licences become harder to earn, and Leaders who work full-time find it difficult to get the leave to run longer camps. Because of this, in many areas the unit camp has been partially or fully replaced by the 'Division Camp', where a few Guides from each unit in an area come together for a weekend. As a result, 'camp preparation' takes up less time in the unit programme and there are fewer opportunities for Camp Permits. There has been a massive increase in so-called 'adventurous activities' with many camps having instructor-led sessions of activities such as archery, climbing wall, canoeing, caving, crate climbing and the like. 'So-called', because actually these are activities which are already familiar to most of the Guides, being the sort of thing they do regularly on family resort holidays every year at 'kids club', so they aren't actually adventurous at all. The most popular camp activities are wide games, pioneering and backwoods cooking - because they don't get to do these anywhere else . . . Kit has become more advanced, with some units using gas burners instead of wood fires, and lightweight tents tending to replace the Icelandics and Stormhavens in many areas - yet most continue to make bedding rolls, even if waterproof bags are starting to become more common than groundsheets as the outer layer. Most camps still do flag ceremonial daily, and while some campsites offer a range of adventurous activities all day and centrally organised activities each evening, for most units the Guides ideal camp is one which intersperses these with plenty of home-made fun - the wide game, the 'silly sports', the night hike, and the campfire as evening draws on . . .
New styles of hybrid accommodation, half-way between camping and indoor holiday, have started to come in with options such as cabins and Yurts. And many units are doing indoor adventure holidays rather than camping. Camping is still the most popular activity for Guides - but the proportion who actually get the chance to camp is declining. Brownie holidays started around the late 1920s, with the introduction of the 'Pack Holiday Licence', although there doesn't seem to have been much publicity around it's launch, as it was some time before Scotland heard about the possibility, and it took a lot of correspondence to work out the right procedure for getting the first person in Scotland licenced - after all, who could test the first candidate! Often, the Brownies would take over a house, or a village school during the summer holidays, with each Six having a bedroom or area, and helping out with the household chores by rota. The activities would tend to be picnics, country walks, and passing the outdoor Golden Bar challenges such as skipping and ball throwing. If they were lucky there might be swimming in a river or exploring the seaside, or visiting a farm to see the animals. In the evenings there might be sing-songs, improvised entertainments, or surprise fancy dress parties. Originally the format was simply that of a holiday, but there grew up a tradition of adding to the fun of the adventure by adopting a theme and incorporating it into the activities. From earliest days (right up until the late 1970s), a Brownie holiday was for a minimum of 5 nights, and a full week was the norm, it would usually incorporate a 'day out' on the middle day of the holiday, where the Brownies would go into a nearby town or village, visit a place of interest, and buy souvernirs to take home - and doubtless visit a swimming pool, partly to enjoy swimming, but mainly to utilise the hot showers! Some units would also have a 'visitors day' when the families could come and see what the girls had been doing, although this was only possible if the holiday was held near to home, and was accessible by public transport - for many decades cars were a rare luxury. From the 1940s onwards, pack holidays grew increasingly popular and that, combined with the demand for premises, led many areas to either obtain and adapt a building, or design and build their own purpose-built 'Brownie House' for Brownie holidays. These purpose-built houses often had bunk beds, large kitchens with enough room for the Brownies to help prepare the meals, and activity rooms with space for playing active games. At Brownie holidays, the main (and most popular) activities would surprise adults - it is the chance to do household chores! Brownies do love the chance to get involved in making meals, to clean a sink until it shines, to be allowed to sweep and mop a floor . . . they also love the games, crafts, and the chance to play with friends. It was only in the 1990s that, following a few experiments, Brownies were allowed to camp in tents . . . at first it caused a deal of concern that girls who had been to Brownie Camp would have the adventure of Guide Camp spoiled - they would have 'seen it all before'. So far, that doesn't seem to have been the case, because at Brownie camp the girls need a lot more help and support from the Leaders than Guides do - help to make up their bedding rolls, the greater part of the tent pitching done for them while they help out with it, either whole unit cooking or an adult directly supervising each group. So when they get to Guide camp, and the Patrol is expected to organise and look after themselves, it is still a step up from what they have done before, and they seem to revel in the increased independence . . . In the 2000s and 2010s, Brownie holidays have become less common. It seems to be down to a combination of factors. Parents concerned that the girls 'aren't read' (although there doesn't seem to be any particular evidence for this). The girls' busy schedule on evenings and weekends makes weekends away tricky, especially if split families are a factor. And fewer Leaders are able to run them - full-time work, family commitments and busy schedules make it difficult. We are seeing more groups going to 'everything laid on' centres like PGL where the staff organise all the catering and activities, and the Leaders can just hand over the girls for the weekend. We also see an increasing number of sleepovers - sometimes at the local meeting hall, but sometimes at exotic venues like museums, aquariums and art galleries . . . Although from the earliest days camping was always the favoured option, indoor holidays have always co-existed with camping. In the early days, when parents were reluctant to allow camping, they were often happier to think the girls would be living in a 'proper building' rather than a fabric tent, so many of the earliest Guide 'camps' of the 1910s were actually held in buildings - but not all! Thereafter, the Guide Indoor Holiday tended to trundle along under the radar. In some areas, it was considered far inferior, in others it was considered acceptable as part of another activity - whether it was a visit to a location such as in a town where indoor accommodation was more feasible, or as part of a trekking holiday between Youth Hostels - or where a Leader's health meant that she could not camp, in which case it was seen as 'next best thing'. Where Guides travelled abroad as a group, it was often more feasible to utilise indoor accommodation, such that Guide hostels were established - both the World Centres such as 'Our Chalet' and 'Our Ark' (now Olave House), and national ones in some European countries. 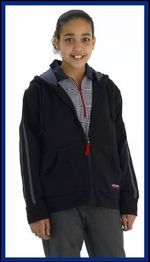 The other advantage of the indoor holiday was in allowing units, particularly those with younger or less experienced Guides, the chance to go on residentials outwith the main camping season in the summer. In recent years, a fashion has grown up for 'package' indoor holidays at commercial centres. For a price (they are usually a much more expensive option), the leaders hand over the Guides to the centre's staff at the start of the weekend, and the staff look after the Guides and organise all their activities virtually 24/7. Meals are prepared by the staff and served in the comunal dining room, and the cooking and cleaning is all done by the staff - there is no opportunity for the Guides to have a go. Meantime, the Leaders are free to occupy themselves as they wish, since the Guides are almost entirely taken off their hands - the centres being designed to cater for unaccompanied children. In times when adults find it hard to get the time to organise traditional residentials, a few have turned into a flood . . . It was really in the 1990s that 'sleepovers' in Guiding started to take off. Up until then, most units would go away for a weekend or longer. Occasionally, an activity which a unit would want to do was in a location or of a duration that made it more realistic to stay overnight rather than try to do it as a day trip, but the sleepover part was just an add-on to the main activity, it was felt to be too much work to do all the organising for a one-night event - after all, it took as much preparation, and as much paperwork, as a weekend or week-long residential did. But then, it was seen that the sleepover part of the outing was in itself adventurous, and might be a useful stepping stone, particularly for younger age groups, or for girls who hadn't been on a residential before, the shorter duration making it less daunting than being away from home for a whole weekend, and some units saw it's potential as a preparation for longer camps and holidays, especially if premises could be found near at hand so the travelling didn't eat too heavily into the activity time. With sleepovers, almost more so than for longer events, 'the theme's the thing'. For a sleepover to work well there really has to be a clear theme running behind all the activities, or a clear purpose behind having the event. It could be to enable the girls to attend an event which, because of it's location, would make it too long and tiring to do as a day trip. It could be to tackle an activity which wouldn't fit into the timespan of a unit meeting, or one which could only be done during daytime. It may be to fit in a series of outings on the one day which would be hard to manage as a day trip. It could be to give a first residential experience to a younger group, or a group who haven't been away before. It could be that a Leader wants to start by being assessed for Overnight Licence, before adding on the necessary modules for an indoor or camp licence. Sleepovers are commonly run for Guides or Brownies for these purposes, but the real explosion in recent years has been in Rainbow sleepovers. Rainbows aren't allowed to go on longer residentials as a unit, so the sleepover is the residential option for the age group, and one which units are increasingly taking up. It gives the Leaders a chance to get to know the Rainbows better, it allows them to do activities which are better done with a higher ratio (like craft and cooking), and can be a great preparation for Brownie Holidays . . .
And where sleepovers used to be either at the regular meeting hall, or at existing Guide holiday houses - now they are taking place in Yurts, Museums, on Boats, in Aquariums, in Art Galleries . . .